Aiphone has become the most respected and reliable brand of communication systems in the world. With headquarters in Nagoya and manufacturing in Toyota City, Japan, and North American marketing, sales and distribution center near Seattle, Washington, we export to over 60 countries. Aiphone products range from simple do-it-yourself door answering units to sophisticated video entry, Security systems, complex microprocessor-based commercial systems and luxury condo/apartment security/communication system. They are unrivaled in design simplicity, technical reliability. With over 30 standard systems, and additional manufacturing by special order, we can create a system for virtually any intercom application. Every Aiphone system is the result of painstaking attention to detail: contemporary European style design, the must quality hardware and circuitry, engineered, built and 100% pre-tested for sustained trouble-free service. Aiphone is the first intercom manufacturer worldwide to receive ISO 9001 certification, and the only one selling in North America, An agency representing the International Standards Organization (ISO). Headquartered in Geneva, Switzerland, graded Aiphone against guidelines for design and development, production, and product inspection and testing. ISO 9001 standards provide an immediate recognition of product quality most anywhere in the world. Aiphone is the first and only intercom manufacturer to win the Deming Prize, the highest international award for quality content. 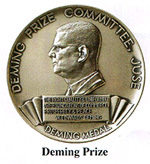 Named in honor of Dr. W. Edwards Deming, the award honors firms Worldwide which advance and maintain manufacturing quality. ISO's Environmental Standards are a series of voluntary standards and guideline reference documents which include environmental management systems, eco-labeling, environmental auditing, life cycle assessment, environmental performance evaluation, and environmental aspects in products in standards. In early 1998, our management team determined to acquire ISO- 14001 approval as a company - wide project, and working committee was established at the same time. Since then, with our ongoing effort and practice about environmental management standards, we have succeeded to acquire the approval. � 1996 - 2011 Securitex Electronic Systems Engineering. All rights reserved.